It will be a day that’s remembered for years to come in Ireland, 11 October 2014. An estimated 100,000 marched in Dublin against the hated Water Charges and Paul Murphy, Anti Austerity Alliance (AAA) candidate, won a By-Election by leading the call for a mass campaign of non-payment and active resistance to this double tax. Just over one year ago the campaign against the Property Tax was defeated, demoralising many undoubtedly, but out of the positives of that campaign the AAA was formed on the initiative of the Socialist Party, to contest the elections in May 2014, where it received a warm welcome from the working class with the election of 14 councillors nationally. Those elections were an indication of a turning point in peoples’ understanding of the potential to resist austerity after seven years of onslaught. 11 October was a social explosion based on that sentiment. A delivery of posters arrived at Sinn Fein HQ in Dublin South West on the morning of Friday 3 October, one week before Election Day. These small diamond-shaped posters carried the slogan that had served them so well in the local and European elections just over four months prior, in which they had made an historic electoral breakthrough. They read simply; “Make the change”. It was part of their plan for a last big push to secure victory in one of their heartland constituencies – which includes the South Tallaght Ward where they achieved a remarkable 50% of the vote in May. Made all the more urgent and necessary because fears were mounting that it was beginning, somehow, to slip away. As teams of determined Sinn Fein activists set out in different directions across the constituency they suddenly became dejected and frustrated. They were met with a sea of red, black and yellow Anti Austerity Alliance (AAA) posters carrying a response to the posters they hadn’t even erected yet, saying; “Make the REAL change – vote 1 Paul Murphy”. 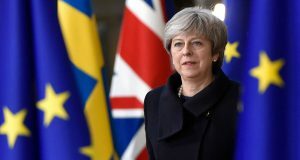 This one small event in a six-week-long election campaign was not in itself that significant, but it was symbolic of how the election overall played out from beginning to end. The AAA set the agenda and was one step ahead in the cut and thrust of the political battle, provoking Sinn Fein to do what it didn’t want to do and sharply and skillfully responding to its attacks. Making the election not just about Water Charges, but about how to fight and beat them, and crucially about who (what force) working class people can trust to fight and beat them. The choice was made clear: should people put their hopes in another political party, like Sinn Fein, to form a government that may abolish Water Charges (as many had done with Labour previously) or should they rely instead on organising in communities, on mass non-payment and protest, and on building political pressure that no government can ignore – including a prospective government that Sinn Fein is a part of. In keeping with the revolt that is emerging on the issue of Water Charges throughout the state, a majority chose the latter and voted for the AAA. All of the political analysts and commentators in Ireland agreed that this election was Sinn Fein’s ‘to lose’ and nobody thought that the AAA could win. The bookies put Sinn Fein at 1/25 to win going in to the election and the AAA at 16/1. 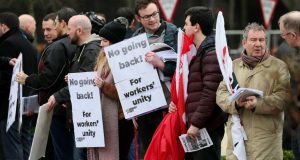 The Local and European elections in May of this year were characterised by a swing to Sinn Fein, particularly in working class communities in Dublin were the Labour Party were turfed out on the back of their betrayals and broken promises. A nationwide opinion poll published by the Irish Times two days before the election put Sinn Fein level with Fine Gael – the main right-wing party in government – as the biggest party in the state, indicating a continuation of that swing. Sinn Fein were extremely confident, justifiably so, but they were complacent as a result and they also made some important miscalculations. They misunderstood the mood on Water Charges in working class communities and how the Irish Water registration packs dropping into homes would inflame the anger that was widespread. They also completely underestimated the AAA and its ability to convince people of the need for an active fight on the issue and to expose the weaknesses of Sinn Fein’s own approach. These factors, among many other issues and events throughout the campaign, proved to be decisive. This election, and the other By-Election in Roscommon / South Leitrim where an anti-establishment, independent candidate prevailed, shows the utter collapse in the support for the main capitalist parties; Fine Gael, Labour and Fianna Fail. 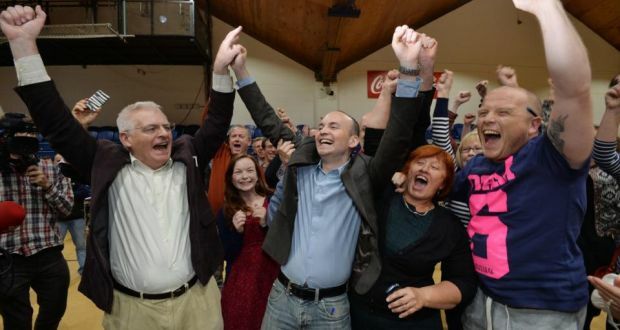 In Dublin South West they won an embarrassing combined vote of just 26%! While this is a snapshot in time and it’s unlikely that votes in a general election would mirror it exactly, make no mistake that these results stem from the same anger that brought 100,000 people onto the streets of Dublin in protest. No amount of propaganda about ‘economic recovery’ (which has been relentless) is likely to quell that anger while people feel crisis and austerity, and see only growing inequality. Timing was certainly key to this victory. The lesson that must be taken from the events over the weekend is that the time to build a new movement to represent working people and against the Water Charges as the sharp expression of austerity, is now. That will be the focus of the AAA from here onwards.